I rarely attend "industry" events. I've turned down a number of invitations and the chance to eat free food over the years. Every once in a while, I make an exception and slip inside to see what goes on. A couple of weeks ago was one of those times. 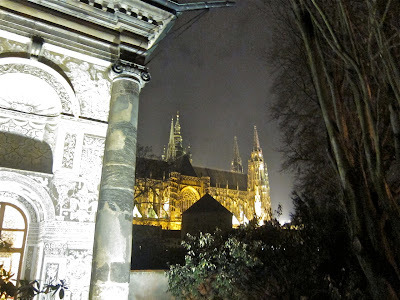 I went to Prague Castle for Pavel Maurer's Grand Restaurant Guide party. Just arriving was pretty spectacular. It was a beautiful walk through the castle gardens to get to the event. Maurer's guide, in book form and online, is something like Zagat's for the Czech Republic. The event honored voters' choices for the top 10 eateries in the country. Their chefs were there, cooking for the invited guests. It was a unique opportunity to sample the food of many of Prague's best and brightest cooks, all in one place. I went as an invited guest's "plus one." The party took place in the Míčovna or Ball Game Hall, which looked gorgeous all lit up at night. 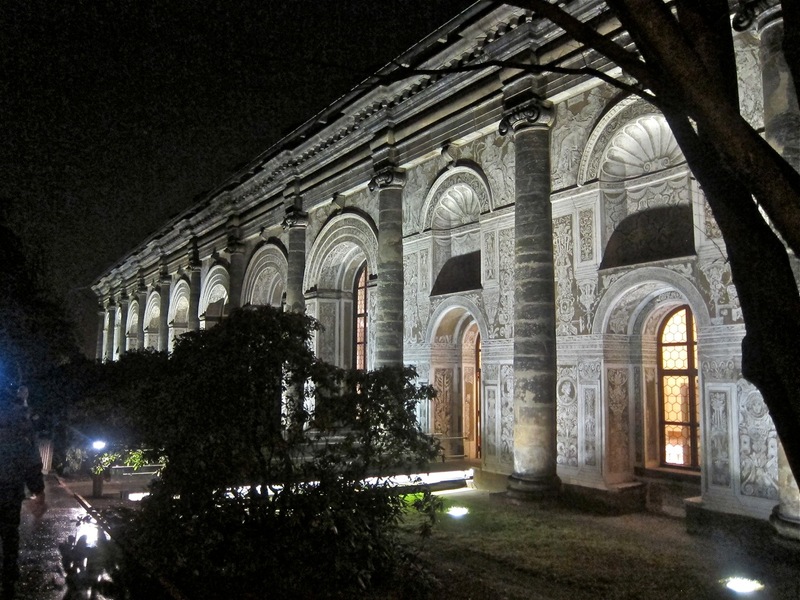 While the outside is richly decorated, the inside is plainer and less distinctive. 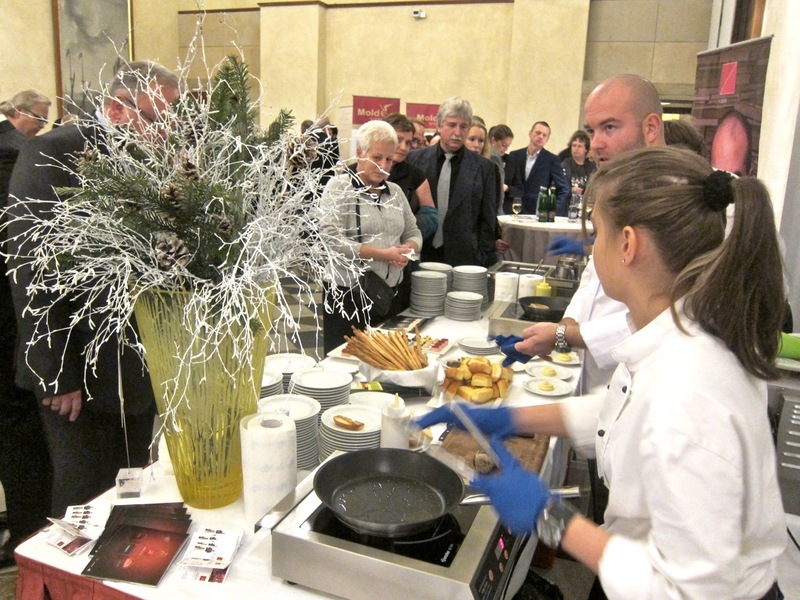 More impressive were the tables with the 10 winning restaurants showing off their cooking skills. That would have to wait. First came a ceremony to announce the winners. That's Pavel Maurer on the right with the glasses. 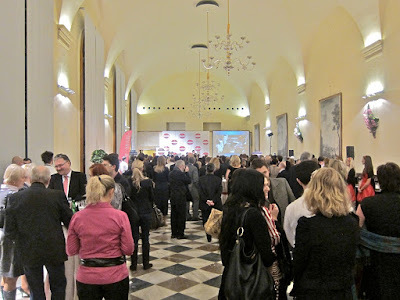 He's also the founder and organizer of the annual Prague Food Festival. 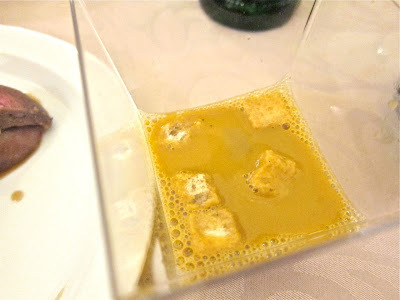 Back in 2007, Radio Prague called Maurer "arguably the Czech Republic’s best known and most influential gourmet." Since then, foodie culture has really taken off in this country, but I still wouldn't argue. 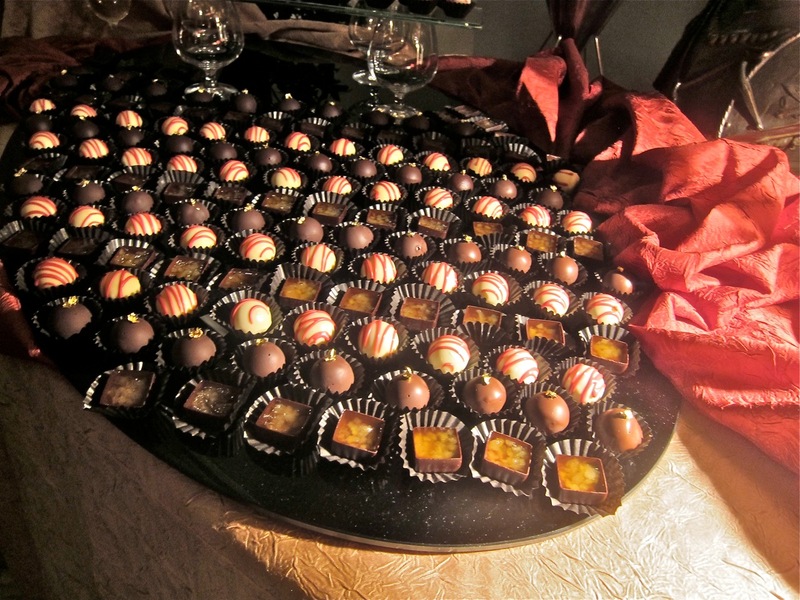 When the award-giving ended, the eating began. It was nothing less than heartbreaking to me that I would not have the stomach space or the time, because of lines, to sample even half of the offerings. I'll now list the restaurants and the food I sampled from each restaurant in the order they were ranked by Grand Restaurant Guide voters. For the sake of efficiency, I planned to skip this table because I had already had the two dishes. 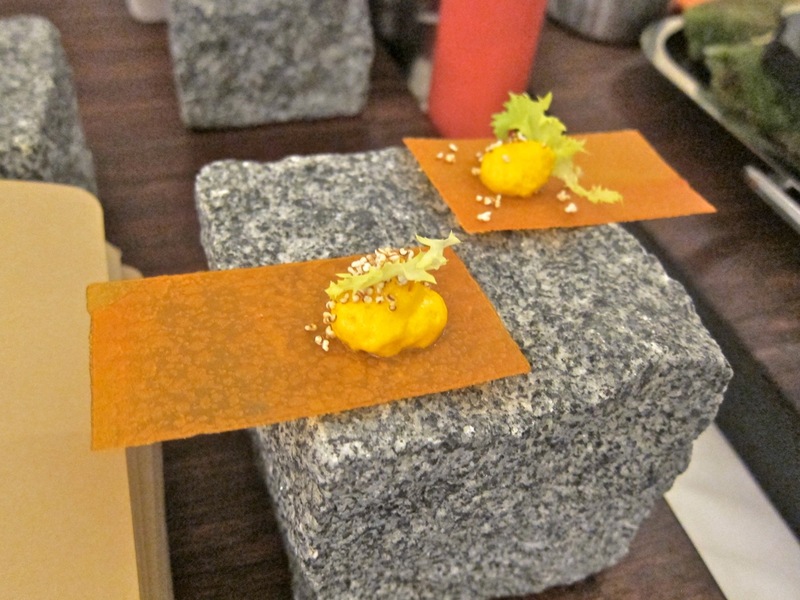 I've been to Sansho five times, liked it a lot, and have the photos of everything I've tried. 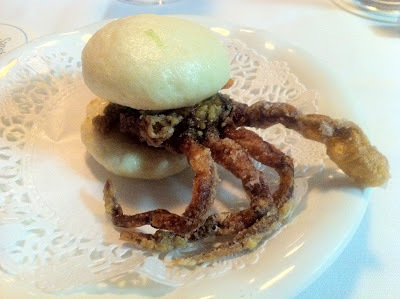 The soft-shell crab sliders were a favorite. These are playfully called "sliders," basically mini-burgers, because they are served on a bao. It's a round Chinese-style bun. This one is served with a dash of wasabi. It's lighter than you might imagine and a clever concept for the delicately crispy crab. 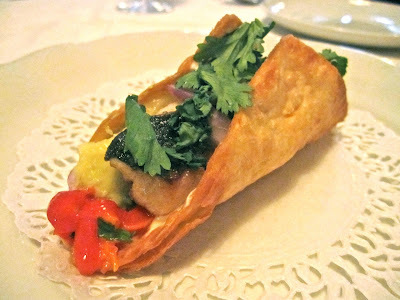 The other dish was Sansho's mackerel ceviche taco. This had good and fresh flavors going on, including a lot of the cilantro that chef and owner Paul Day favors. But it's less appealing for me, mainly because I find mackerel too dense and oily. This restaurant served a terrine of game with a cherry chutney. It was dense and yes, gamey in a good way. I like sweet and salty combinations so the cherries worked for me. They also served chunks of venison that tasted to me and my friend like a fairly simple goulash. We weren't so impressed with that. What I ate during my visit to the restaurant several months ago was much better. The lamb and foie gras dishes were particularly good. Still, the tab of close to 4000 CZK with no alcohol involved was hard to swallow. I write from a personal perspective, and it is worth making my particular value system clear. Although I'm a well-known burger fanatic and appreciate greasy street food, I'm also someone who spends 1500 CZK for a meal on a fairly regular basis. If I spend over 2000 CZK, it's usually for a place I already know is good or comes with credible recommendations. When the bill is over 3000 CZK, I start to get skeptical about value for money. A cook here excitedly told me about this next dish. 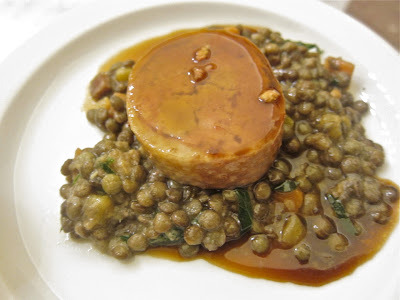 It was a goose neck stuffed with goose, duck, pork, and foie gras served on French lentils. I'll be honest and say I was taken aback by the description. I'll also be honest and say the combination and texture of these meats wrapped in goose skin did not work for me. Much better was the veal "gravlax" with celery root remoulade. My friend raved about that. Unfortunately, I didn't get a picture of it. We only got to one dish here, but it was a good one. They served a small plastic cup filled with veal tongue, fresh-water crayfish, and pumpkin. The salty chunks of meat, with the delicate shell fish and the sweet squash was quite a unique and enjoyable combination. It's fair to say the chef was more focused than my camera. 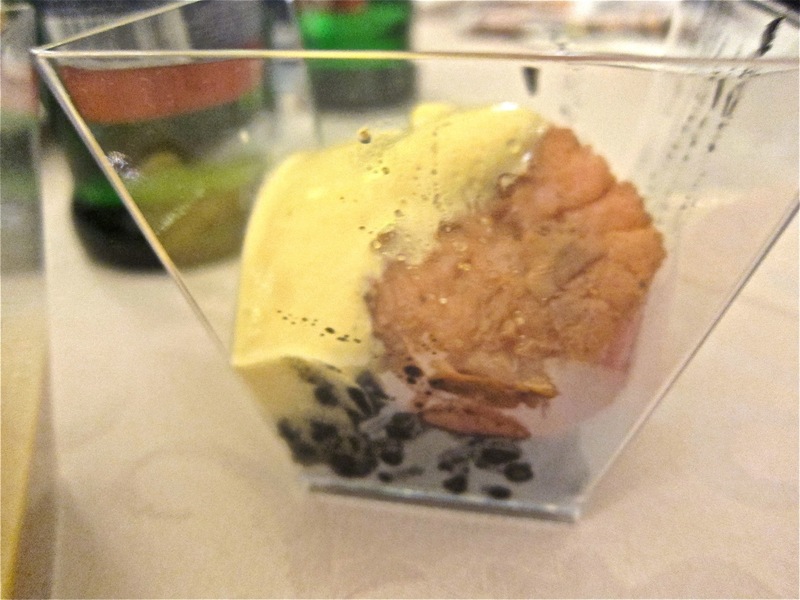 This restaurant received Michelin's Bib Gourmand for its "good value European cooking" and I suppose dishes like this. I was sorry I missed out on their beef ribs with chanterelle sauce. This was the one Brno restaurant that made it to the top tier. 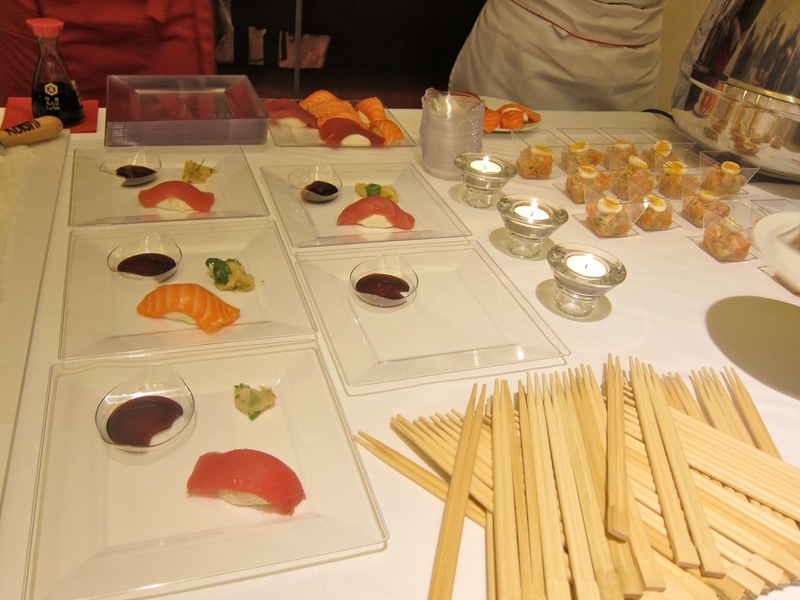 Here we tried their surprising interpretation of salmon and tuna nigiri. Instead of putting the fish on rice, here they put it on buffalo mozzarella with vinegar for dipping. You have to suspend expectations when you take the first bite, but we both gave it thumbs up. We also had the salmon tartare with spring onion and cucumber with miso-mustard sauce and quail egg. This was fine, but made a more ordinary impression. 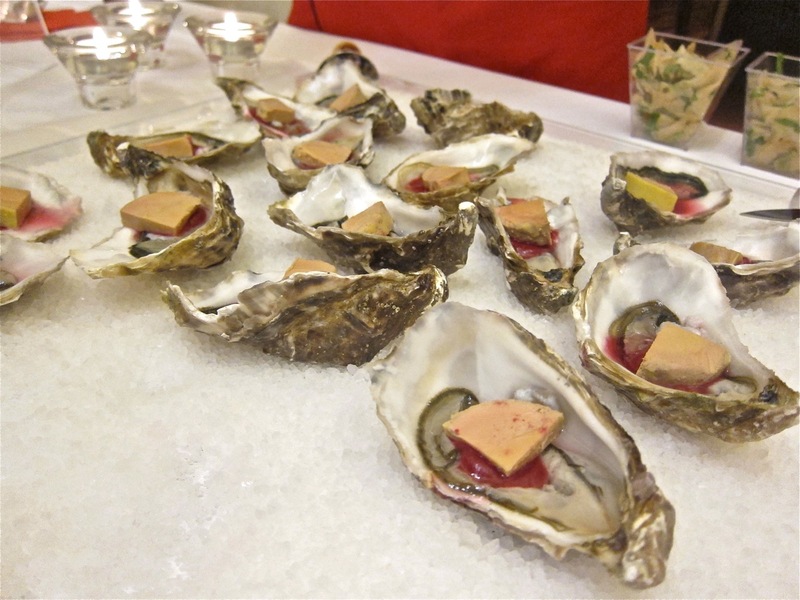 Due to our passion for fresh seafood, we tried a third offering: the oyster with vinaigrette, foie gras, and beet. The reaction here was mixed. My friend loved it and thought the combination was excellent. I didn't. While I'm not thrilled about paying this restaurant's prices, I think they often cook well. I was especially impressed with their dishes at the Prague Food Festival. 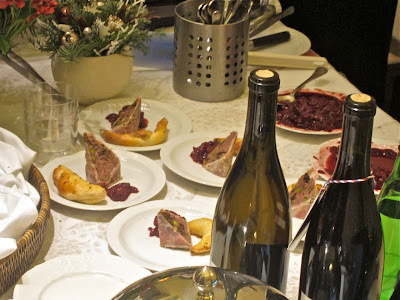 On this night, we liked their game pâté with homemade brioche and cranberry jelly. 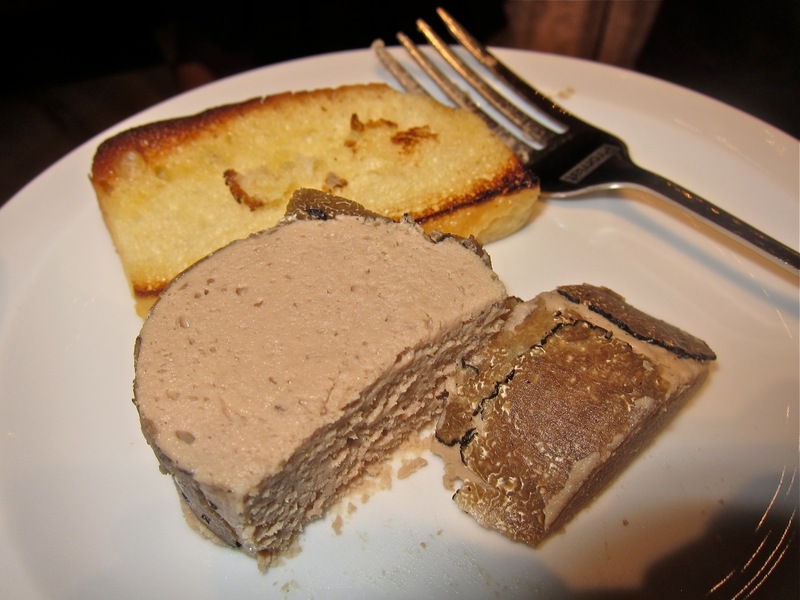 I thought it was more flavorful and moist than the game terrine from Chateau Mcely. We didn't get a taste of the perch with beet, potato kasha, and Riesling sauce. This is a restaurant that I've talked about going to for a long time. I've had a number of friends tell me it was an amazing experience. They also told me they spent more than 8000 CZK for two with the wine pairings that they considered a must. It's just me, but I'm not sure I can enjoy any meal at that price. First, I had a parsley and pine dumpling topped with a mushroom purée. This restaurant is famous for its fun presentations and distillation of flavors. The ethereal and delicate green dumpling looked like a sponge. It was a nice little bite. Also entertaining was the carrot wafer with sorrel, corn, and something I'd never heard of before (if I got the translation right): sea-buckthorn berry. It was intriguing, different, and I liked it. I might feel a little differently if I paid a princely sum for the single mouthful. 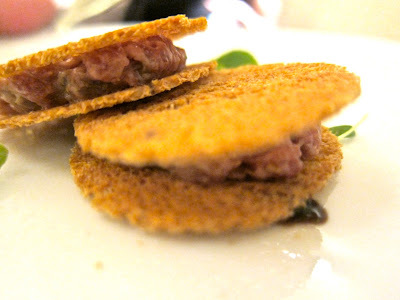 I also had the beef tartare, cutely sandwiched between thin, delicate wafers. This was much less creative and tasted relatively simple. If you want a better picture that someone else took of this at the restaurant, you can find it here. In the past, this restaurant's seafood-starring Sunday brunch has been an expensive favorite of mine. 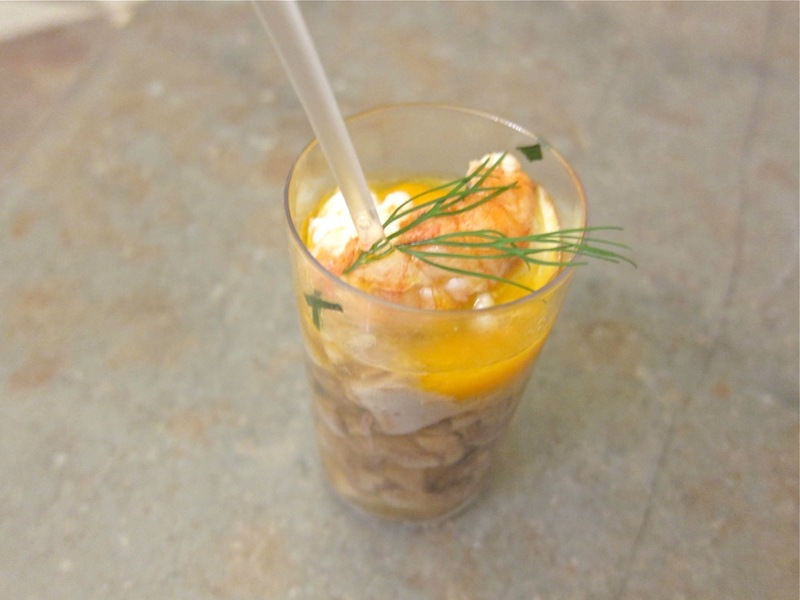 At this party, I tried their lobster bisque. It was sweet, creamy, lobstery, and I really enjoyed it. My friend was a little less excited about it. The deer saddle with chestnut-truffle purée and rosehip sauce was something special. 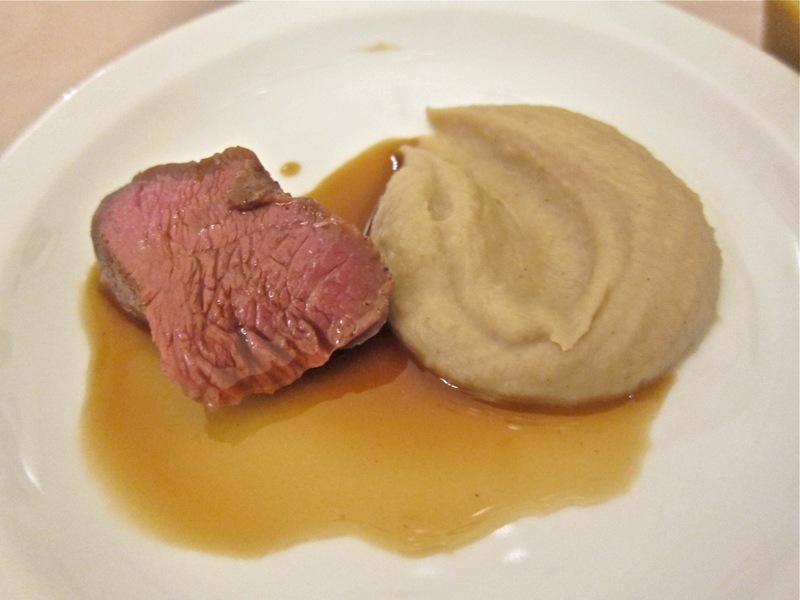 While I liked the rare meat, the lightly sweet purée with a hint of the expensive mushroom was just amazing. I ate in this restaurant many years ago and enjoyed it. It's tiny and felt like eating in rather exclusive club. I'm sure it has changed a lot since then, but their event offering showed they still have top talent. We loved their expertly seared scallop with cuttlefish ragu, fregola, which is something like a large couscous, and saffron foam. Sorry the picture is not very good. I didn't drink any alcohol, but perhaps I was suffering from serious food intoxication at this point. You'd expect this restaurant to wow people with one of the best dishes. And in my view, it lived up to that expectation. 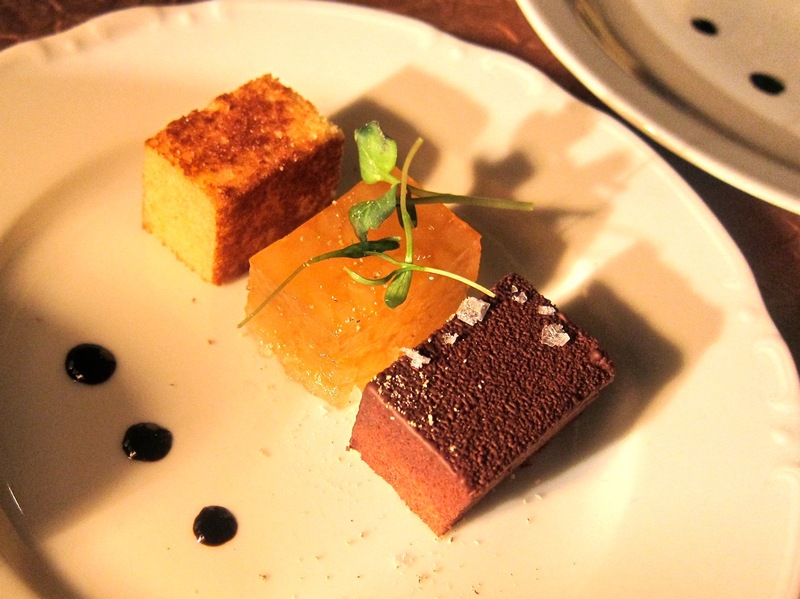 Their small block of duck liver dusted with Valhrona chocolate sat smartly next to Poire Williams-flavored jelly and a homemade brioche. The rich and creative plate inspired a big smile from me. 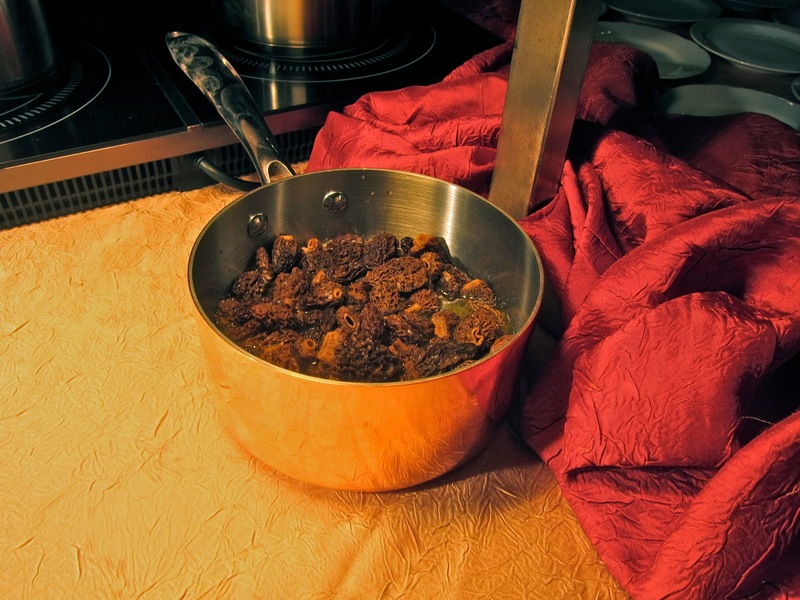 Because of long lines, I didn't get to try their veal cooked sous vide with homemade pasta and these amazing looking morels. They ran out before I got there at the end of the night. I end pondering the question: Did the voters get it right? Certainly, many of the Czech Republic's biggest talents are in the top 10. The list seems to line up more with my views with each passing year. But there are still anomalies. For example, on the voters' list, Sansho is ranked 10th, but SaSaZu, another Asian fusion spot that is one of my favorites, is 36th. 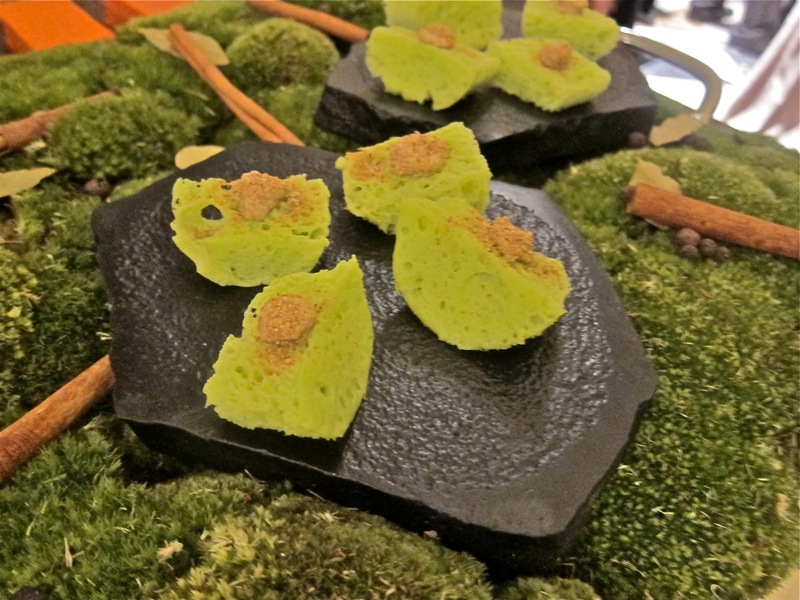 However, on Maurer's list decided by 45 restaurant experts, Sansho is 5th and SaSaZu is 6th. That's closer to my thinking, but I'd rank SaSaZu even higher. "1. Restaurants do not have to pay to be included. 2. Independent voters are all people who wants to participate and register on web. Not only Czechs. 3. Every year our security system excludes approximately 25% false votes." Even if I don't agree with all the voter rankings, I do enjoy debating them. And I certainly appreciate that more and more people in this country are not only paying attention to good food and restaurants, they're also paying for it. 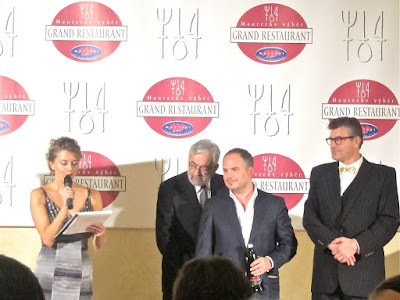 Restaurateurs who are aiming to be the best don't always win prizes. But they are doing worthy work because to me, a fine meal is one of life's great prizes. I just wish I had room for one dessert at the end.